02/13/17 Nissan north america, inc. (nissan) is recalling certain model year 2013-2015 altima vehicles manufactured january 3, 2013, to july 29, 2013, 2015-2016 rogue vehicles manufactured october 14, 2014, to august 12, 2016, and 2016 maxima vehicles manufactured june 4, 2015, to august 19, 2015. an incorrect occupant classification system (ocs) electronic control unit (ecu) may have been installed in the front passenger seat. the incorrect ecu and seat combination may misclassify the front passenger seat occupant. 06/10/16 Nissan north america, inc. (nissan) is recalling certain model year 2016-2017 nissan maxima, 2013-2016 nissan altima, nv200, leaf, sentra, and pathfinder, 2014-2016 nissan nv200 taxi, infiniti qx60, qx60 hybrid, and q50 hybrid, 2014-2017 nissan rogue and infiniti q50, 2015-2016 nissan murano, murano hybrid, and chevrolet city express, 2014-2015 nissan pathfinder hybrid, and 2013 infiniti jx35 vehicles. in these vehicles, the front seat passenger occupant classification system (ocs) may incorrectly classify an adult passenger as a child or classify the seat as empty despite it being occupied. as a result, the passenger frontal air bag may be turned off and not deploy in the event of a crash. For the full text of TSBs: Get a 1 year subscription for only $19.95 from ALLDATAdiy! Use Code DIYDISCOUNT. Click here now! 12/14/15 Nissan north america, inc. (nissan) is recalling certain model year 2015 altima and 2016 maxima vehicles manufactured october 6, 2015, to october 7, 2015. the affected vehicles have front brake calipers whose mounting bolts may not be properly tightened. 11/30/15 Nissan north america, inc. (nissan) is recalling certain model year 2013-2015 altima and pathfinder vehicles, 2013-2014 nissan sentra vehicles, 2013 infiniti jx35 vehicles, 2014-2015 infiniti qx60 vehicles and 2014 infiniti qx60 hybrid vehicles. the affected vehicles received an incorrect occupant classification system (ocs) control unit during a repair. these ocs control units may incorrectly classify the front passenger seat as empty, when it is occupied by an adult. 08/18/03 On certain passenger vehicles originally sold in or currently registered in the states of alaska, colorado, connecticut, iowa, idaho, illinois, indiana, kansas, massachusetts, maine, michigan, minnesota, missouri, montana, north dakota, nebraska, new hampshire, new york, ohio, pennsylvania, rhode island, south dakota, utah, vermont, wisconsin, and wyoming. at extremely cold temperatures, moisture in the fuel tank could freeze and form ice crystals. these ice crystals may obstruct the suction opening of the fuel pump. This can prevent the supply of fuel to the engine and cause the engine to stop, which could result in a crash without warning. Dealers will install a screen at the suction opening of the fuel pump to prevent ice crystals from blocking the opening. owner notification began on august 18, 2003. owners should contact nissan at 1-800-333-0829. Nissan recall nos. r3012/p3142.customers can also contact the national highway traffic safety administration's auto safety hotline at 1-888-dash-2-dot (1-888-327-4236). 07/28/03 On certain vehicles equipped with the 2.5 liter engine, the exhaust pipe hanger pin may catch debris from the road that could be ignited by contact with the main catalyst. also on 2002 altima and sentra vehicles, certain engine operating conditions may cause the pre-catalyst to overheat and damage the catalyst substrate. Either of these two conditions could result in a fire. Dealers will remove the protruding portion of the exhaust pipe hanger pin. in addition to the corrective action, in order to reduce the risk of fire in the event of poor or improper maintenance that could result in oil spillage, heat shield(s) will be installed on the pre-catalyst and exhaust tube. owner notification began on july 28, 2003. owners who take their vehicles to an authorized dealer on an agreed upon service date and do not receive the free remedy within a reasonable time should contact nissan at 1-800-647-7261. nissan recall nos. r3007, r3014, r3015, r3016, r3017. also on 2002 altima and sentra vehicles, certain engine operating conditions may cause the pre-catalyst to overheat and damage the catalyst substrate. if substrate particles enter the combustion chamber, they could score the cylinder walls, resulting in increased oil consumption. if the engine oil level is not checked on a periodic basis and drops below the low level, and the driver continues to operate the vehicle ignoring noticeable engine noise, engine damage may occur which could result in a fire. the pre-catalyst will be tested to ensure it is working properly and replaced if necessary. if damage is found inside the pre-catalyst, it will be necessary to replace the engine. 04/21/03 On certain vehicles, the electrical connector for the driver air bag may come loose. if the connector comes loose, the supplemental air bag warning light flashes intermittently. The driver side air bag will not deploy in the event of a crash, increasing the risk of personal injury. Dealers will install a retaining clip on the clock spring electrical connector. owner notification began april 21, 2003. owners who take their vehicles to an authorized dealer on an agreed upon service date and do not receive the free remedy within a reasonable time should contact nissan at 1-800-647-7261. Nissan recall no. r3001.customers can also contact the national highway traffic safety administration's auto safety hotline at 1-888-dash-2-dot (1-888-327-4236). 09/28/15 Engine Nissan north america, inc. (nissan) notified the agency on july 31, 2015, that they are recalling certain model year 2016 nissan maxima vehicles manufactured february 10, 2015, to august 18, 2015. on october 14, 2015, nissan expanded the recall to cover an additional 41,388 vehicles, including certain model year 2013-2015 altima 3.5 vehicles equipped with a v6 engine manufactured march 30, 2012, to august 18, 2015 as well as the vehicles covered by the july 31, 2015 notification. in the affected vehicles, due to an improperly installed o-ring that may not have been seated correctly at the time of assembly, fuel may leak during a crash from the area where the fuel sending unit attaches to the fuel tank. 01/18/08 Engine On certain passenger vehicles that have had the body control module (bcm) replaced during service at a dealership, the tire pressure monitoring system (tpms) may have been inadvertently deactivated due to an issue with the dealer service software. if the tpms is turned off, it would not alert the driver to a decrease in the tire pressure as designed. Driving on under-inflated tires is unsafe and could result in a crash. Dealers will check the tpms function and reactivate it if necessary. the recall began on january 18, 2008. owners may contact nissan at 1-800-647-7261. Nissan recall no. p7267.customers may also contact the national highway traffic safety administration's vehicle safety hotline at 1-888-327-4236 (tty 1-800-424-9153), or go to http://www.safercar.gov. 12/31/07 Engine On certain passenger vehicles equipped with a 2.5l engine, the crankshaft position sensor can overheat causing a brief interruption in the signal output from the sensor. If the interruption in the signal from the crankshaft position sensor is so brief that the electronic control module (ecm) logic does not have time to diagnose the condition, the engine may stop running without warning while the vehicle is driven at a low speed increasing the risk of a crash. Dealers will reprogram the ecm free of charge. certain my 2006 altimas which have been previously remedied under recall campaign 06v223 (nissan r0606) are not included in this recall since the reprogramming for 06v223 also included this reprogramming. the recall began on december 31, 2007. owners may contact nissan at 1-800-647-7261. This is an expansion of a previous campaign (06v223).customers can also contact the national highway traffic safety administration's vehicle safety hotline at 1-888-327-4236 (tty 1-800-424-9153), or go to http://www.safercar.gov. 07/03/07 Engine On certain vehicles, if a sufficiently hot object enters the air filter housing through the engine fresh air intake system and contacts the engine air filter, the flammability characteristics of the air filter material are such that the filter may ignite. If the air filter material ignites, a fire may occur. Dealers will replace the air filter with a new one that has improved anti-flammability material characteristics. the recall began on july 3, 2007, and will continue through october 1, 2007. owners may contact nissan at 1-800-647-7261. Nissan recall no. r0703.customers may also contact the national highway traffic safety administration's vehicle safety hotline at 1-888-327-4236 (tty 1-800-424-9153), or go to http://www.safercar.gov. 09/20/06 Engine On certain passenger vehicles equipped with a 2.5l engine, the crank angle sensor is affected by temperature variations. under certain driving conditions, these variations in temperature can be large enough to cause a brief interruption in the signal output from the sensor. If the interruption in the signal from the sensor is so brief that the electronic control module (ecm) logic does not have time to diagnose the condition, the engine may stop running without warning while the vehicle is driven at a low speed increasing the risk of a crash. Dealers will reprogram the ecm free of charge. the recall began on august 21, 2006. owners may contact nissan at 1-800-647-7261. Nissan recall no. r0606.customers can also contact the national highway traffic safety administration's vehicle safety hotline at 1-888-327-4236 (tty 1-800-424-9153), or go to http://www.safercar.gov. 06/09/06 Engine Certain passenger vehicles equipped with 2.5l engines may experience excessive engine oil consumption as a result of improper performance of the piston rings. If the oil is not maintained at least at the minimum level, engine damage can occur and in extreme cases result in an engine fire. Dealers will reprogram the electronic control module (ecm or engine computer). your vehicle will also be inspected to determine if it has been consuming engine oil at a higher than normal rate. in a small percentage of vehicles, engine replacement will be needed. on june 9, 2006, nissan notified owners of the possibility of excessive oil consumption and the importance of maintaining the oil at a proper level. follow-up letter to owners advising them of the status of the recall was sent during august 2006. followup letter to owners was sent on november 15, 2006. owners may contact nissan at 1-800-647-7261. 12/22/03 Engine On certain passenger vehicles, the circuit board for the crank position sensor or cam position sensor may have an improper solder joint due to solder deformation caused by heat stress accelerated by the existence of flux residue during the soldering process. This could cause the "service engine soon" warning light to come on, create a no start condition, cause reduced engine power, or cause the engine to stop running without warning during vehicle operation, which could result in a crash. Dealers will replace the crank position sensors. camshaft position sensor(s), and in some cases, the variable timing control sensor(s). vehicles involved in a previous recall campaign, 01v357, are also included in this new campaign. the replacement sensors used in that campaign are also affected. owner notification began on december 22, 2003. owners should contact nissan at 1-800-647-7261 or infiniti at 1-800-662-6200. Nissan recall no. r3022/infiniti recall no. r3021.customers can also contact the national highway traffic safety administration's auto safety hotline at 1-888-dash-2-dot (1-888-327-4236). 11/12/12 Suspension and Steering Nissan is recalling certain model year 2012-2013 altima vehicles manufactured from may 10, 2012, through july 26, 2012. these vehicles may have been equipped with transverse link bolts and power steering rack bolts that were not torqued to proper specification. The affected bolts could become loose and fall out which may lead to a loss of vehicle control, increasing the risk of a vehicle crash. Nissan will notify owners, and dealers will tighten the bolts to the proper torque specifications. the safety recall is expected to begin during november 2012. owners may contact nissan customer service at 1-800-647-7261. 08/08/11 Suspension and Steering Nissan is recalling certain model year 2011-2012 nissan altima sedan vehicles manufactured from april 25, 2011, through june 10, 2011 at the canton, mississippi plant. the transverse link bolt may not have been torqued to the proper specification. this condition could cause the bolt to become loose while the vehicle is being driven, creating a rattling noise and vibration. If the bolt comes out completely, the driver may experience difficulty controlling the direction of the vehicle which could result in a crash. Nissan will replace the transverse link bolts and nuts and tighten them to the proper torque specification free of charge. the safety recall began on august 8, 2011. owners may contact nissan at 1-800-647-7261. 10/08/09 Suspension and Steering Nissan is recalling certain model year 2009 and 2010 altima and maxima passenger cars. the upper front strut insulators may have been manufactured out of specification resulting in a potential for the strut insulator to crack. If the strut insulator is cracked, there is a potential for the strut rod to come out of its mounting position, which could affect vehicle stability and increase the risk of a crash. Nissan will notify owners and dealers will replace both left and right side front strut insulators free of charge. the safety recall began october 2009. owners may contact nissan at 1-800-nissan1 (1-800-647-7261). 08/11/08 Suspension and Steering Nissan is recalling 1,018 my 2008 altima vehicles. the left side front suspension transverse link bolt may not have been tightened to specification. this condition could cause the bolt to become loose while the vehicle is being driven. If the bolt were to come out, the driver may experience difficulty controlling the direction of the vehicle which could result in a crash. Dealers will tighten the transverse link bolt to specification free of charge. the recall began on august 11, 2008. owners may contact nissan at 1-800-647-7261. 02/27/06 Suspension and Steering On certain vehicles, the rear subframe may have been manufactured incorrectly, which could result in a crack in a bracket which holds part of the rear suspension. If the bracket is cracked, the stability of the vehicle may be affected under severe driving conditions. this could lead to a loss of control of the vehicle which could result in a crash. Dealers will inspect the rear subframe to determine if it was manufactured incorrectly and replace it, if necessary. the recall began on february 27, 2006. owners may contact nissan at 1-800-647-7261. Nissan recall no. pb016.customers may also contact the national highway traffic safety administration's vehicle safety hotline at 1-888-327-4236 (tty 1-800-424-9153), or go to http://www.safercar.gov. 11/30/15 Electrical and Air Conditioning Nissan north america, inc. (nissan) is recalling certain model year 2013-2015 altima and pathfinder vehicles, 2013-2014 nissan sentra vehicles, 2013 infiniti jx35 vehicles, 2014-2015 infiniti qx60 vehicles and 2014 infiniti qx60 hybrid vehicles. the affected vehicles received an incorrect occupant classification system (ocs) control unit during a repair. these ocs control units may incorrectly classify the front passenger seat as empty, when it is occupied by an adult. 04/14/14 Electrical and Air Conditioning Nissan north america, inc. (nissan) is recalling certain model year 2013-2014 altima, leaf, pathfinder, and sentra, model year 2013 nv200 (aka taxi) and infiniti jx35 and model year 2014 infiniti q50 and qx60 vehicles. in the affected vehicles, the occupant classification system (ocs) software may incorrectly classify the passenger seat as empty, when it is occupied by an adult. 05/06/13 Electrical and Air Conditioning Nissan is recalling certain model year 2013 altima, leaf, pathfinder, sentra, and infiniti jx35 vehicles. sensors within the passenger occupant detection system (ods) may have been manufactured out of specification. this may cause the system to malfunction and permanently suppress the passenger airbag. If the vehicle is involved in a crash necessitating airbag deployment and the passenger airbag is suppressed, there may be an increased risk of personal injury. Nissan will notify owners, and dealers will inspect the ods sensors and replace them as neccessary, free of charge. the recall began on may 6, 2013. owners may contact nissan customer service at 1-800-647-7261. 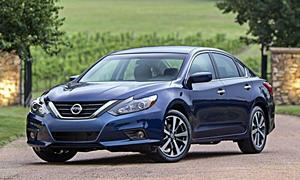 03/12/12 Electrical and Air Conditioning Nissan is recalling certain model year 2012 altima and versa vehicles. these vehicles may be equipped with side curtain air bags that contain an incorrect propellant mixture for the initiator component used, resulting in insufficient output of compressed gas. The side curtain air bags may not deploy, increasing the risk of injury. Nissan will notify owners, and dealers will replace one or both side curtain air bag modules, as necessary, free of charge. the safety recall began on march 12, 2012. owners may contact nissan customer service at 615-725-1000. 08/22/11 Electrical and Air Conditioning Nissan is recalling certain model year 2012 nissan altima vehicles manufactured from june 15, 2011, through june 21, 2011 and model year 2012 nissan nv vehicles manufactured from june 23, 2011, through june 28, 2011 because the air bag control unit (acu) was assembled incorrectly. The affected acu will not operate as designed and this issue may cause the air bags not to inflate in a crash when they are designed to inflate. this could increase the risk of injury. Nissan will replace the air bag control unit free of charge. the safety recall began on august 22, 2011. owners may contact nissan at 1-800-647-7261. 11/04/08 Electrical and Air Conditioning Nissan is recalling 204,361 my 2007-2008 altima, altima hybrid, 350z, 350z roadster, my 2008 altima coupe, rogue, my 2009 murano, and infiniti my 2007-2008 g35 sedan, my 2008 g37 coupe and ex35 passenger vehicles equipped with continental automotive systems' occupant classification system (ocs) control units. a varistor in the ocs control unit located in the passenger seat cushion may have been manufactured out of specification. under certain conditions, this could cause an interruption of signal between the ocs and the air bag control unit (acu). This could result in the passenger air bag being suppressed which could fail to provide adequate protection in the event of a crash. Dealers will test the signal between the ocs and acu systems using a special tool to check that it is functioning as designed. if necessary, the seat cushion (containing ocs hardware) will be replaced with a new one manufactured to specification. the recall began on november 4, 2008. owners may contact nissan at 1-800-647-7261 or infiniti at 1-800-662-6200. 02/16/17 Other Nissan north america, inc. (nissan) is recalling certain 2015-2017 altima vehicles. the rear door latch/lock cable on the vehicles may have been improperly routed. as a result, lowering a rear window may inadvertently cause that door to unlatch and open. 02/17/16 Other Nissan north america, inc. (nissan) is recalling certain model year 2013-2015 nissan altima vehicles manufactured march 6, 2012, to december 31, 2014. in the affected vehicles, the secondary hood latch may bind and remain in the unlatched position when the hood is closed. 03/31/15 Other Nissan north america, inc. (nissan) is recalling certain model year 2013-2015 nissan altima vehicles manufactured march 1, 2013, to december 31, 2014. in the affected vehicles, the secondary hood latch may bind and remain in the unlatched position when the hood is closed. 10/20/14 Other Nissan north america, inc. (nissan) is recalling certain model year 2013 nissan altima vehicles manufactured march 6, 2012, to february 28, 2013. in the affected vehicles, interference between the hood inner panel and the secondary latch lever, in combination with debris and corrosion, may cause the secondary hood latch to bind and remain in the unlatched position when the hood is closed. Nissan will notify owners, and dealers will be instructed to modify the bend angle of the hood actuation lever to eliminate potential interference with the hood inner panel. in addition, dealers will clean and lubricate the latch joint as needed. if significant corrosion is observed, the latch assembly will be replaced. this repairs will be performed free of charge. the recall began on october 20, 2014. owners may contact nissan customer service at 1-800-647-7261. 04/29/13 Other Nissan north america is recalling certain model year 2013 altima vehicles manufactured march 21, 2012, through march 26, 2013. the spare tires may have been significantly over- or under-inflated. Tires that are significantly over- or under-inflated may fail without warning, increasing the risk of a crash. Nissan will notify owners, and dealers will inspect and adjust the spare tire pressure, as necessary, free of charge. the recall began on april 29, 2013. owners may contact nissan at 1-800-647-7261. 05/13/10 Other Nissan is recalling certain model year 2010 altima vehicles manufactured from april 7, 2010 through april 13, 2010. some of the front side member assembly components may not have been welded to specification due to a tool maintenance error. If several structural welds are out of specification on a single vehicle, it may have an effect on the vehicle crash performance. Dealers will inspect and if necessary repair free of charge. the safety recall began on may 13, 2010. owners may contact nissan at 1-800-647-7261. 01/12/09 Other Nissan is recalling 225 my 2009 altima vehicles for failing to comply with the requirements of federal motor vehicle safety standard no. 214, "side impact protection." these vehicles may have been manufactured with an out-of-specification weld on the door assembly. This does not meet the standard requirements. All the affected vehicles have been brought back from the dealerships and remedied at the factory. no vehicles had been retailed. Customers may also contact the national highway traffic safety administration's vehicle safety hotline at 1-888-327-4236 (tty 1-800-424-9153), or go to http://www.safercar.gov . 09/15/08 Other Nissan is recalling 3,403 my 2009 altima vehicles equipped with 16-inch alloy wheels. some these wheels may not have been manufactured to specification. this could cause one or more of the five lug nuts attaching the wheel to the vehicle to become loose. If the lug nuts become loose, it could eventually result in a loss of control and a crash without warning. Dealers will inspect the vehicle to determine if it is equipped with one of the affected wheels. if it is, the wheels will be replaced with new ones that have been manufactured to the correct specification. the recall is expected to begin during september 2008. owners may contact nissan at 1-800-647-7261.